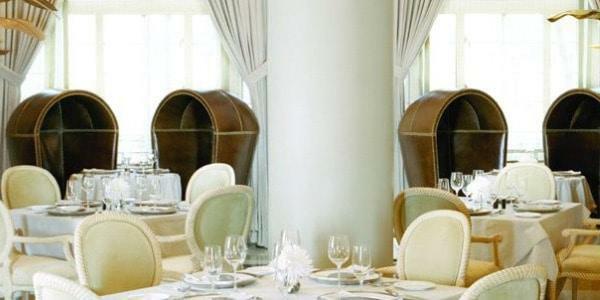 The La Marea Restaurant in The Tides South Beach hotel provides elegant, upscale dining with a seaside retreat feel. As you take in the exquisite ocean views you have the opportunity to taste contemporary Mediterranean cuisine with touches of Northern Italian cuisine. The menu focuses on local seafood and produce and creates a balance of aroma, texture and flavor. La Marea has a variety of options to tantalize your taste buds any hour of the day. The Lazy Breakfast Menu offers delicious options such as oyster shooters, crab cake benedict with a corn bread biscuit and cilantro hollandaise, and a NY strip steak and egg sandwich. As the day goes on, delight yourself with the Acapulco prawn cocktail, tempura shrimp fritters or pan roasted diver scallops off the appetizer menu. Add in an order of tuna or beef tartare for your slightly more adventurous side. If a salad is what appeals to you as you gaze out over the ocean, try the organic baby arugala or Trinidad tuna nicoise salad. Keep your meal simple yet delicious with a falafel wrap or Tides burger, or kick things up with pasta entrées such as the miso glazed black grouper or the bucatini all’amatriciana. Dessert will entice you with the key lime crème brulee or chocolate lava cake purse. For a different view of the spectacular setting, dine poolside off the Small Bites Menu, which includes the crispy fish tacos and Kobe skirt steak quesadilla. The exquisite dishes pair beautifully with unique cocktails like the Tides Royale or Miami Vice, or a freshly muddled Passion Royal Caipiroska. If more traditional is your style, choose a glass of wine or Champagne off our stellar wine list. La Marea provides amazing food alongside breathtaking scenery. Whether you are there for romance, the oceanfront views or South Beach people watching, the tantalizing tastes of the La Marea menus will win you over. You can expect sophisticated dining from morning through evening with delicious libations to enhance your experience and compliment every dish.